Release of the "YB125SP," a new YB series variation model for the Chinese market - News Releases | Yamaha Motor Co., Ltd.
Yamaha Motor Co., Ltd. announces the addition of the "YB125SP" model to the Chinese market YB series lineup with release scheduled for late June 2012. The "YB125SP" is aimed at expanding sales in the Chinese motorcycle market by answering the needs of customers looking for a highly practical motorcycle that is also easy-to-handle and affordable. It is a product aimed at "expanding business scale" as outlined in Yamaha Motor's next medium-term management plan. * Group company Chongqing Jianshe ⋅ Yamaha Motor Co., Ltd. (CJYM) will manufacture this motorcycle while Shanghai Yamaha Jianshe Motor Marketing Co., Ltd. (YMSM) will be in charge of marketing. The Chinese motorcycle market has an annual demand of around 14 million units and motorcycle models designed for practical use comprise about 60% of the market (Yamaha Motor survey, 2011 results). 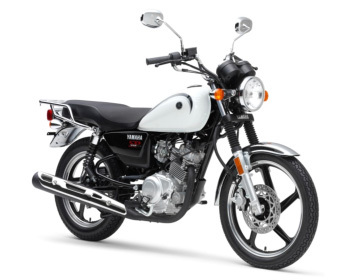 The "YB125," manufactured by CJYM since 2004, has won a strong following for its excellent utility and reliability. The "YB125SP" inherits the same basic performance characteristics as the current "YB125" while also providing easy handling and ridability for beginners and comfort while transporting goods over longer durations or riding with a tandem passenger. It is also designed for a relaxed riding position with easy leg reach to the ground, has a long and low seat for comfortable tandem riding and a flat rear carrier for plenty of carrying capacity. Furthermore, choices for wheel type (cast or spoke) and front brakes (drum or disc) are available, thus providing four different model variations as well as optional chrome finish on main exterior parts. *Yamaha Motor is currently working to increase its corporate value through sustainable growth by expanding "business scale," improving "financial strength" and augmenting "corporate strength" as outlined in its next medium-term management plan (2013-2015).